Lighting up lakes and burning down creeks and rivers. Flint; the ultimate tool for Anglers!! The Flints platform-style design is packed with integrated features that are there when you need them and out of your way when you dont. 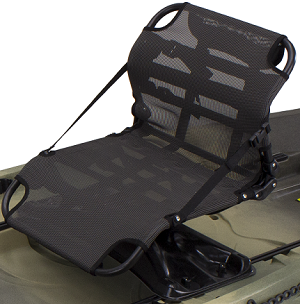 The Pinnacle Seating System sets a new standard for fishing kayaks; its simplicity and comfort are unmatched. The Flint is not only an entirely new NuCanoe. 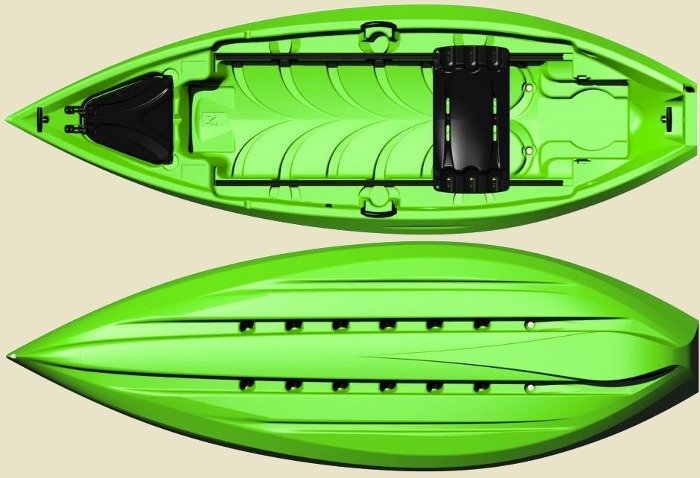 Its an entirely new Fishing Kayak. Go beyond the ordinary. Get in the Flint. At the boundary between canoes, kayaks, and small boats, lies the Frontier. Frontier is full of opportunities, enabling new adventures and delivering unique experiences. Shown above; our Frontier 12 with one Pinnacle 360 seat with quick release and swivel on a rigid seat base. In the Frontier, you can do things your way... a better way! You can choose to go solo in style OR tandem with room to spare. You can position one or two seats anywhere along the 70" Freedom Tracks. Face the action with 360° Mobility. Don't just sit, you can stand, even walk with confidence on the 20" wide Cast & Blast Deck. In the Frontier, there are no limits. Put rod holders where you like them - on the Universal Mount Docks, or in the Freedom Track. Take all the tackle you could possibly need, and secure it in the Gear Vault or strap it in the Crate Space. Extra rods? Just remove the Hatch Sack to tuck them away in the Rod Chamber. Frontier can be paddled, poled or motored into the all best spots. Places unreachable with too large a craft, or heaven forbid, no craft. In the Frontier, the journey & the destination are up to you. Fish in the lakes. Float the rivers. Hunt in the marshes. Paddle through the surf. Go for a sunset cruise in the bay. Do more… and enjoy more! Go beyond the ordinary. Go to the Frontier. The Frontier 10 is here....and it is all that we hoped it would be. Super stable, incredibly maneuverable, completely customizable, and easy to handle off the water. We are sure you'll be impressed too! Read on to learn the details, watch the Frontier 10 in action, and learn about all the new features. All in all just about as expected, except for the weight. We'd have loved for the F10 to be down in the low sixties, but we were not willing to compromise hull strength and integrity to make this happen. That said, when handling the Frontier 10 off the water, it feels light and easy to carry/transport/load. Speaking of strength, the Cast & Blast Deck is rock solid, and the contour of the hull is such that water will not pool near the bow or on the sides. The redesigned channels near the scuppers means the F10 bails fast and no water stays behind. Stability - Well, it is a Frontier, so you'd expect it to be stable. And it is super stable and very comfortable for standing. Tracking - I think the biggest surprise for most people who paddle the Frontier 10 will be how well it tracks. It is not quite up to the "straight as an arrow" tracking of the Frontier 12, but once you get a couple paddle strokes in, the F10 holds a straight course. And maintains a straight glide when the paddling stops. Paddling - Again, this is going to surprise people. The Frontier 10 moves real nice through the water ...nothing like you would guess form the 38.5" beam. Maneuverability - The Frontier 10 can literally be turned 360 on its own axis. Easily whip the boat 180 degrees with just 2-3 paddle strokes. Nimble as can be for those tight waters and small creeks. 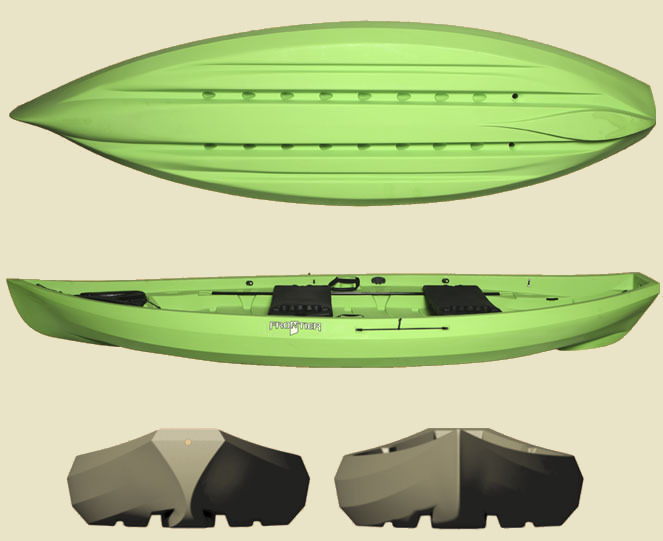 This unique watercraft is customizable and adaptable. We sell the Frontier with either one or two Seat Bases, depending if you like to go solo or with a partner. Seat Bases are easily removed or customized. Choose either the Rigid Seat Base, Custom Height Base OR the Multi-Base Seat. You get to decide what you want and where you want it. And you can change it whenever you like. We have several in-stock Frontier seat options to show you! Use the Multi-Base Seat like an economical bench seat. You can also flip it over and mount a swivel and a Camo 360 seat. The SitBacker seat can also be added to the Multi-Base seat. 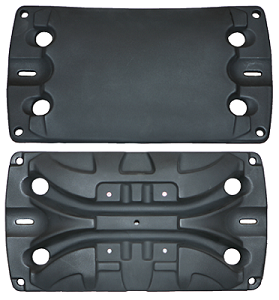 All Seat bases are adjustable along the Frontier's Tracks. maximum comfort with the Camo 360 Seat. and a 15" tall back rest. Color: Camo. along with the Camo 360 Seat. maximum comfort with the Pinnacle 360 Seat. and a 15" tall back rest with adjustable lumbar cushioning. OR the Custom Height seat base.